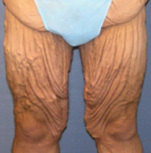 Loose skin on your thighs occurs after losing weight and part of the aging process. Thigh lift surgery at the Atlanta Center for Breast and Aesthetic Surgery helps men and women in the greater Atlanta area achieve a toned appearance on the thighs. Our Thigh Lift Before and After Pictures feature some of our patients who rely on Dr. Frederick T. Work, Jr., for their thigh lift procedures. Your commitment to a healthy lifestyle means that you want to look toned and fit. Unfortunately, the extra skin and fat on your thighs cannot be corrected with diet and exercise. Thigh lift surgery by Dr. Work removes the sagging skin and little pockets of stubborn fat. Liposuction is sometimes not the best option for the thigh area because the procedure does not address larger pockets of fat or loose skin. For the thigh lift procedure, Dr. Work uses a technique that will address your individual needs based on the location and extent of the extra skin and fat. The incision may be placed along the crease between the pelvic area and top of the thigh or lengthwise on the inside of the thigh from the top to the knee area. 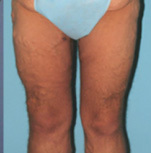 To see the results of the surgery, browse our Thigh Lift Before and After Pictures. Fatty tissue and loose skin keep you from showing off your legs. Our Thigh Lift Before and After Pictures demonstrate the benefits of thigh lift surgery at the Atlanta Center for Breast and Aesthetic Surgery. Contact us today to schedule a personal consultation.